The Young and the Restless (Y&R) spoilers tease that the CBS soap is gearing up for a holiday special. Mal Young, Y&R’s head writer and executive producer, dished on the upcoming drama in an interview with the CBS website. He offered some interesting hints about the Christmas episode as well as some info on what’s ahead in 2018. Young immediately started brainstorming some story ideas. Unfortunately, he felt like it had all been done. Previous Young and the Restless writers had already covered the usual holiday topics. Young wanted to incorporate classic themes in a fresh way and he eventually settled on how he could make that happen. That’s a great strategy since many people will have family staying with them as Christmas draws near. Even if a relative doesn’t typically watch Y&R, he or she won’t have a problem following along. As for the rest of us loyal Y&R watchers, we’ll love it even more. Young explained that he essentially wrote “four little mini-movies.” Each one is inspired by a holiday song. 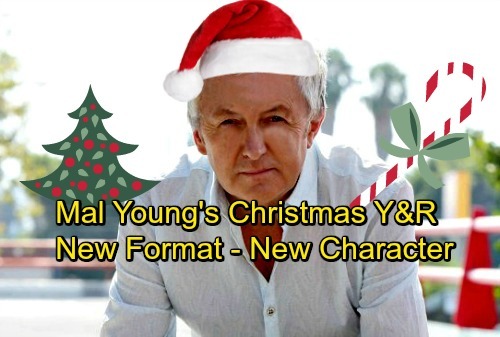 Young took different Christmas carols and formed them into stories for our favorite Genoa City residents. This sounds like something fans will definitely want to tune in for. As for what’s to come in the new year, Young suggested we’d see a few more self-contained episodes in the mix. Young wants to dive deep into one story on occasion and help us gain a better understanding of how it affects the characters. Sounds like a new soap format entirely – one that doesn’t require viewers who are expert in Y&R’s history – this is an obvious attempt to gain new fans. Young also noted that a guest character made quite an impression in the Christmas episode, so the show decided to bring her back for another appearance. The Young and the Restless spoilers say this intriguing character will pop up again in an early 2018 episode. It looks like Mal Young has some fun things in store. We’ll give you updates as other news comes in. Stick with the CBS soap and don’t forget to check CDL often for the latest Young and the Restless spoilers, updates and news.